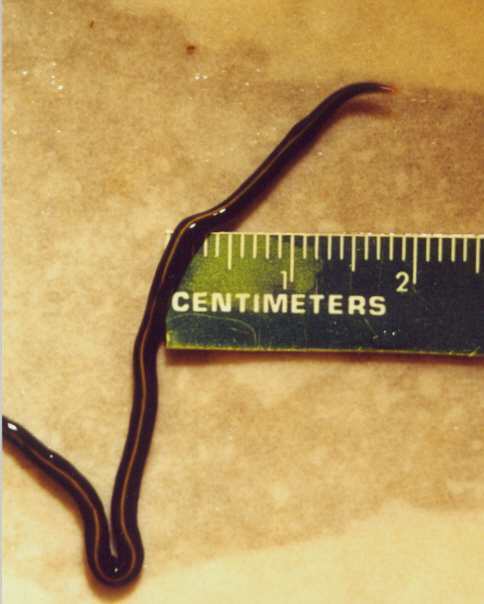 This land planarian in the United States was first found in residential gardens of Pasadena, California and described in 1943 by Dr. Libbie H. Hyman under the name Geoplana vaga Hyman, 1943. The species belongs in Family Geoplanidae and Subfamily Caenoplaninae characterized by having ventral testes. There are also fewer eyes forming a single row around the anterior . This species is the Type Species of the genus Caenoplana Moseley, 1877. Its endemic localities are in Australia and New Zealand. The species in U.S.A. is Caenoplana coerulea vaga (aka Geoplana vaga Hyman, 1943). It is quite an attractive planarian being largely blue (=coerulea) with a narrow stripe of yellow dorsally and an orange anterior tip that becomes colorless after fixation. This species was first collected by Dr. de Laubenfels prior to 1943 in America from gardens in Berkely and Pasadena, California. It was then described in 1943 by Dr. Libbie H. Hyman. Other localities are known in Tallahassee, Florida (1961); Statesboro, Georgia (1972); San Antonio, Texas (1978) and James Island, Charleston, SC by Dr. Julian Harrison. The species survives best in a warm climate. Comparative studies show that American populations are conspecific with C. coerulea complex in Australia and New Zealand. It is very likely that the first invaders were introduced accidentally with potted plants and soil (see Ogren, 1989b) Ball & Sluys (1990). Recently I received a live specimen from Dr. Rowland Shelley who reported it was collected by C.M. Bogen 30 May 2001, in rotting wood in the backyard of a private residence in North Carolina, Wake co., CARY, 1202 Gray Owl Garth. Dr. Shelley is Curator of Terrestrial Invertebrates, Research Lab., North Carolina State Museum of natural Sciences, Raleigh, N.C. 27607. The following photoviews are useful to show the living body form and color (Fig.1)as well as the appearance when preserved (Fig.2). There is another new locality I failed to mention above. C. coerulea was found in a residential garden of Cedar rapids, Iowa, in the Spring of 1999.The discoverer (Mr. van Hoe) reported that the flatworms (C. coerulea and Bipalium adventitium) were attacking earthworms and slugs in his gardens. Preserved specimens of these species were identified in the Spring of 2001 by Dr. Hugh D. Jones, University of Manchester, Manchester, U.K., a well known flatworm specialist. Fig. 1. Living planarian in locomotion, 95 mm long, 2mm wide, anterior at top: . Fig.2.Dorsal view of preserved worm: . Last update: Saturday, November 3, 2001 at 9:06:01 PM.